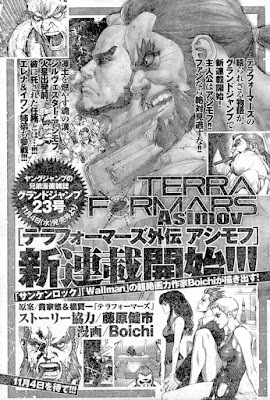 Just a little update to inform you guys that a new Terra Formars spinoff was announced recently. You might have already noticed this via the 4chan threads on /a/, or the Terra Formars wikia. Either or, there isn't any info on it other than it's being drawn by Boichi, written by that guy who did the Outer Mission novels (Kenichi Fujiwara), and it's about Asimov before the launch of Annex 1. What specifically, who knows. Though I'm sure further details will come out sooner or later, so we'll just have to wait and see. Anyhow, seeing how it's another spin-off the artwork is terrible and lacking like always in comparison to the main series itself, and that's bad. That said, in other news, I'm just about finished translating the first chapter of Rain Hard, so I should have it out sometime this week. Keep a lookout for it. Bye! P.S. - ANN also did a post on it if you're wondering. Also, FYI, I did mean to post this yesterday. Kinda forgot.